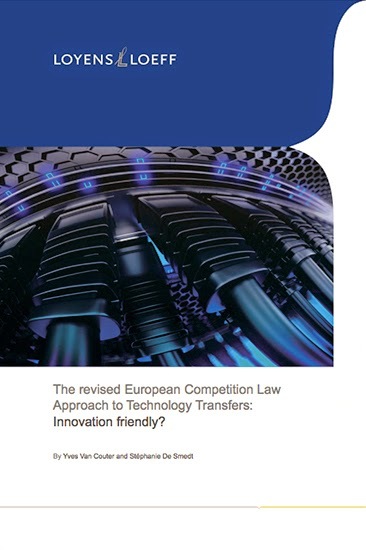 The revised European Competition Law Approach to Technology Transfers: Innovation friendly? is the title of a new book penned by Stéphanie De Smedt and her colleague Yves Van Couter, both from the Brussels office of Loyens & Loeff (Stéphanie's a junior IP-IT lawyer, while Yves is a partner). This title seeks to provide readers with an overview of the main changes of the new technology transfer exemption regime (which entered into force on 1 May 2014), together with an assessment of their possible impact on the plans and potential plans of businesses contemplating engaging in technology rights transfer and/or licensing agreements within the EEA -- as well as those who, having engaged in tech transfer activities, might be wondering what they've let themselves in for. The book can be downloaded free of charge by clicking here. Commission Regulation 316/2014 of 21 March 2014 on the application of Article 101(3) of the Treaty on the Functioning of the European Union to categories of technology transfer agreements can be downloaded free of charge by clicking here -- but it's not as much fun.